If you are employed when you become sick the pillar 2 pension will pay out at the rate it would have paid out had you worked until you reached normal retirement age. Look on the pension certificate for the amount. You *must* have listed the pillar 2 pension company on the IV (AHV) application. Assuming you have, then the pension company is bound by the decision of IV as to your level of disability. IV is required to make a decision within 12 months of your application (IIRC). In my experience they make their decision at the end of the period. The employer hasn't given contractual notice (although they had previously (last year) said they would). Instead they ask now with two weeks notice to agree to a voluntary mutual termination. As my friend is still signed off sick does the employer really need to still pay salary? The pension certificate just says "IV according to the rules". I believe the rules changed somehow relatively recently. IV was involved more or less from the start, so already more than a year ago and the case was referred to the IV pension office in April of last year. At the moment we're confused as to whether there's a disadvantage to accepting the voluntary termination of employment. To me I feel that there must be. As I understand it this isn't true. IV has already said the employer can give notice at any time (after 3 or 6 months of sickness) but the insurance would still run. From what we've read we don't expect the IV pension to be very much anyway but it would be nice to have things sorted. The company can terminate at any time. They should however respect the terms of the employment contract. The company needs to pay the salary if the contract is still valid. I definitely wouldn't sign any mutual termination agreement. The contract needs to be kept valid for as long as possible. If you are 100% sick as per doctor's notes, then RAV will not pay anything. As far as I know you need to be at least 30% fit to work for RAV to pay something. But whatever the level of inability to work, the process needs to be gone through if the IV decision has not come through and if the contract has been terminated (notice period has commenced). In some cases the RAV process needs to be gone through even if you are awarded a 100% IV pension. If he's signed off sick then the RAV won't pay out right as he's not fit for work? Or maybe true and false. If the salary is being paid, then the contributions are deducted from there. But if an insurance is paying money in lieu of the salary, then I don't see where they can be deducted from. I was in this situation and I don't recall paying or having unemployment insurance contributions being deducted from what they were paying me. OK, I'm a bit worried now. If an IV pension is granted does that mean that the sickness insurance would need to be repaid? Or is it that the IV would reimburse some of the pension to the insurance company? From what I understand the IV pension will be tiny compared to the previous salary or sickness insurance amounts. PS thanks so much for the replies so far. If an IV pension is granted does that mean that the sickness insurance would need to be repaid? Or is it that the IV would reimburse some of the pension to the insurance company? Maybe, but their problem, not your friend's. From what I understand the IV pension will be tiny compared to the previous salary or sickness insurance amounts. Yes, about the same as social assistance. Rent, health insurance, and 1k/month for food and other expenses or so. The amount you get per month will depend on what percentage of disability is granted as well as the number of years of contributions you have made to the system. Mine is not tiny. It is a 100% pension. 1st pillar is roughly 20% of the previous salary. 2nd pillar is about 50% of the previous salary. So all in all it is about 70% of the previous salary. And that was with only 6 or 7 years contributions to the system from several short-term, part-time jobs and one full-time job which lasted about 4 years. 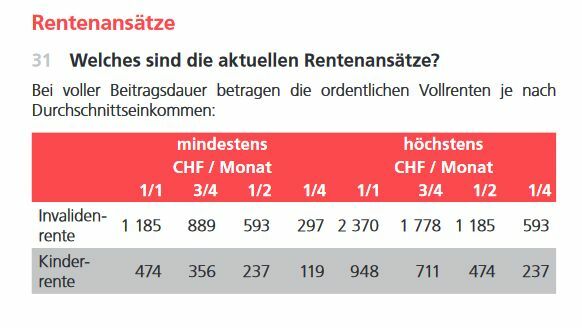 From the4.04.d brochure Invalidenrenten der IV they have the following table which shows a maximum of 2,370 per month. Yes those are the minimum and maximums. However the minimums can be lower than that if you have only a few years worth of contributions. Moreover those amounts are for the 1st pillar only. On top of that you get a part from your 2nd pillar. Thanks! I managed to find some information on the pillar 2. It seems the total projected pension amount is taken into account and then the annual pension is 6.8% of this amount. It'll be less than the pillar 1 figure. He's paid in for 6 years but is already 50. Going on the RAV for a few months would be a better option, assuming no jobs available. As said, RAV will only pay out if you are at least 30% fit to work and even then it will be far less than a salary and possibly not enough to live off - again it will depend on the percentage of inability to work. If they are already 50 and only paid in 6 years via employment deductions, you need to check (it will be done automatically by IV anyway) if contributions were paid in periods of non-employment and during self-employment as if they were then you have more than the 6 years you refer to. Moreover you need to be aware that if you have worked in other countries, the Swiss authorities will notify the authorities of the other countries that IV in CH has been requested. A separate disability procedure then kicks off in that (those) country(-ies). If awarded disability in the another country then this is paid out on top of what you receive in CH and (I believe) regardless of the amount that CH pay out. Note the decision of one country's disability authorities as to whether you receive a pension at all is of little bearing to the decision of other countries. It could be that you have worked in CH and two other countries, CH pay out, one other country pays out but one doesn't. This is because each country has its own rules for awarding disability and its own right to appeal procedures in case you are not awarded disability by a country and wish to contest that decision. CH tends to be generous with IV in my opinion, compared to other countries. The UK pays out, but the amounts are much lower (yet this is supposedly because the cost of living is lower in the UK - the fact that you may reside in CH will also have no bearing for example on the UK's decision of what to pay if anything). Other countries may be less generous with the decision and certainly with the amounts. [QUOTE=Landers;3031049]OK, I'm a bit worried now. If an IV pension is granted does that mean that the sickness insurance would need to be repaid? Or is it that the IV would reimburse some of the pension to the insurance company? From what I understand the IV pension will be tiny compared to the previous salary or sickness insurance amounts. Unlikely to have to repay anything. TIS, so it is impossible to be exact in every case, different Kantons etc. Im my case, it is also not the direct IV that makes the financial difference but the second pillar IV and the effects of IV on my pillar 2 pension - but then one has to way up the financial considerations with the psychological implications of becoming a long-term sickness benificiary and obviously take into account how the family view the situation. The implications of taking IV are different at 50 or 60. - but then one has to way up the financial considerations with the psychological implications of becoming a long-term sickness benificiary and obviously take into account how the family view the situation. The implications of taking IV are different at 50 or 60. The money doesn't make much difference as the life expectancy is only a few years but it'd be nice to know what to expect etc. I think I have all the info now thanks. Thanks very much for all the responses. In mine too. Will be the case of most people who have worked for a least a couple of years. For people who have never worked only a tiny amount, it will be the reverse, in some cases there is no 2nd pillar at all. That would be painful. but then one has to way up the financial considerations with the psychological implications of becoming a long-term sickness benificiary and obviously take into account how the family view the situation. The implications of taking IV are different at 50 or 60. Tell me about it. Try being told you're going on it in your early 30s! In some cases you don't take it, you are simply put on it by your employer, at least this was my experience and that of a couple of colleagues working at the same place. Three years of working is required to qualify but it's the total number of years/total amount of money you could theoretically have paid in in the absense of disability which counts. If you qualify at 20 you're going to pretty much get full pension (based on your current salary). If you only qualified at 60 you're going to get almost nothing. OK we have another question, related to the pillar 2. When we looked at the annual pension statement we noticed that the pension credits in the statements were only about 80% of the pension contribution amounts that were on the monthly payslips. Are pillar 2 contributions taxed? I thought the idea was the pension contributions were tax free. I don't see any statement of tax or any other deductions from the contributions listed on the payslips or pension statements. Last edited by Landers; 21.01.2019 at 00:31.